They are a perfect replica of the original one. Price is 29$, shipped to your door, but, there is a catch, it must be PayPaled as gift please. For those of you who have already shown interest, I will PM you shortly. Last edited by Jack Flash; 09-12-2017 at 06:14 AM. If you're taking your carbs off and haven't replaced your stock plastic choke fittings, or if you are experiencing strange, intermittent carb issues - these are the ticket! I chased jetting issues for months until I replaced my previous owner jerry rigged choke fittings. Sagging choke cables, poor fitting cable boots, sticking chokes - not good. BTW, I received my fuel screws yesterday. You da' man once again! When does production start on needle jets? Well, like everything else in life, everybody wants some, but, they don't really want them when they're done. So, after a few flakes, I have some of these left if anyone one else may be interested. I'm not a flake. Got mine today. They're awesome. Mine came in the mail today and they are beautiful. A very big "thank you" to Jack Flash for offering and supplying these. I got mine and had them installed within minutes. Super easy and gives you a peace of mind. My old ones were so brittle and having replaced one of the plastic ones with another from a set of parts carbs, this made for very delicate carb removal and installation. Now, I can rip those suckers out of there, like startin' an old outboard! Well, it sure would look cool made of brass! Might be a bit heavy though. Making them would not be an issue. The issue is if you make them in aluminium, it needs to be treated with an anti friction. If you make them in brass, I don't believe weight would be such an issue, but, the wear factor will still be one. Jack can you please set aside a set for me and put them in the same parcel as the fuel screws when made? I will then need to know your payment details thanks heaps. If you have a set left I'd like one and will paypal as soon as you confirm. Thanks. Fresh off the grill if needed. Jack, I need a set. Let me know how to take care if this. 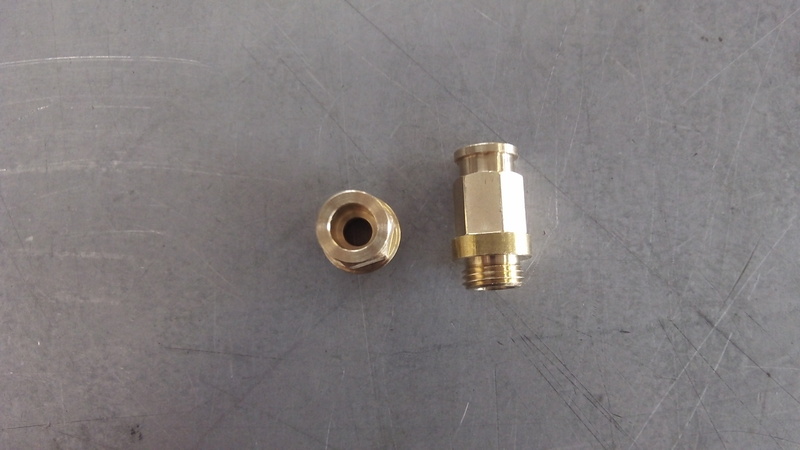 Quick Reply: Choke fitting replacement, brass made.